Yesterday I was upset to hear that the Swiss government has cut the number of B-permits it issues each year to non-EU residents from 5,000 to 2,500. That's a cut of 50% this year (50%!). The country is so paranoid about its 4% unemployment rate (4%!) that as usual, the foreigners are becoming its scapegoats. But as an unemployed foreigner, I speak from experience that about half the people in my local unemployment office appear to also be foreigners. So let's see. 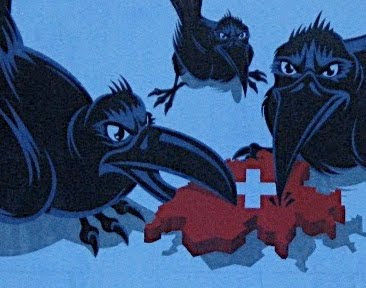 We're not taking Swiss people's jobs, we're losing our own. We get laid off first. And now, to add insult to injury, we also get kicked out first. The head of the HR department at my husband's international company told him she is frustrated with this as well because it makes hiring personnel all the more difficult. She can't find enough Swiss engineers to fill the positions at her company to save her life, but now the government won't let her hire those she can find because heaven forbid, they're the Non-EU version of the F-word. According to her (and she's Swiss), Non-EU B-permit holders are not typically taking jobs away from the Swiss. If you want to see who is, head over to your local Aldi and listen to the cashiers speaking high German there. Most Non-EU B-permit holders are working in highly specialized jobs that could not be filled by a Swiss and is the reason they were allowed into Switzerland in the first place. And in my opinion (I'm not biased of course! ), losing half of a highly-qualified workforce will only hurt Switzerland's economy in the long run, not help it. But who needs engineers anyway? Anyhow, that's my little "raclette rant" of the day. Anyone else have an opinion on this? I hear that we're lacking engineers, but as a swiss engineer, finding a job is difficult. I don't know what to think anymore. I'd be curious to know where your husband works - off blog of course. I wanted to add something: protectionism is common in less favorable economic times and for example, many engineer jobs in the SF bay area have a non-relocation clause right now... Yes, the situation's worse there than here, but the idea behind it is quite similar, I think. That said, I had no idea about the amount of B-permits being cut by half. What I think is stupid is that the swiss universities and tech schools have a lot of foreign students that pay the same (low) tuitions as swiss students, which means their studies are paid by swiss taxes, but once they graduate, they have two weeks to leave the country. IMO, that'd be the first thing to change, keep those highly qualified graduates with a swiss education and give them a B permit and a job. And one more thing: if two candidates have similar profiles and equal qualification, but one is swiss, the other isn't, I think it's normal to give the priority to the swiss candidate. But if no swiss candidate is qualified for the job, then getting a B-permit shouldn't be that difficult. But, but, I am taking care of my husband who works here. That counts, right? Good rant! And now I'm going to be nervous all over again about our renewal. Juanita, no what you do definitely counts! Someone's got to take care of these working men otherwise they wouldn't last long! Kathy, don't be nervous. Ok, who am I kidding, I'm nervous too! But I think if you're already in the country you will have an advantage. Done. I took the contact info from your official website. This is interesting. I have a B permit but we aren't sure why. Most of my husband's coworkers wives don't have B permits. our guess was that I was given one because I am an engineer and we had also heard that Switzerland is lacking engineers. But I came with no plans to work here. I feel bad- my permit could be used for someone who plans on working! M'dame Jo, I'll be on the lookout for your email. Mrsmac, I have no idea how the permit decision works. I got a B too along with my husband who was the one that came here with the job. My guess is that spouses both get the same permits? I don't know. This is troubling news. I'm glad we already received our "invitation" to get B-permits (an upgrade from Ls). Like others, I get the same permit as my working husband, even though I am die Hausfrau. Interesting post I stumbled upon through Greg C's blog. M'dame Jo - I can't disagree with any of your points, but I find your SF non-relocation clause a bit of a weak argument. I'd guess that is to keep expenses down for businesses rather than protectionism, especially knowing there are loads of unemployed folks in the area. Say what we will about the Swiss and their protectionism, the country runs along in a seemingly very precise, very Swiss way. Peter, you're right, this may be another reason, I didn't think of it. But still, I'm not sure that paying a couple extra thousands at sign-on makes such a difference compared to the charge of hiring someone new. Also, I'm curious: Do companies also pay for relocation if you're across the US? I know the scale is totally different, but if you have to move from Geneva to St-Gallen for your job, you won't get a rappen. And I wouldn't be surprised if moving 200km in Switzerland was as expensive as moving 2000km in the US. Many companies used to pay for for relocation across the U.S. (my husband got paid to move in 2001). But I think the economy has changed things now. I think I read a stat recently that said only about 20% of companies pay now. It's a sad world we live in. Yes, it sort of depends on the company/industry. On the plus side, if you pay to move yourself for a job, you get a tax break. You're right though, the expenses are fairly minimal, but at this point with so many unemployed, it doesn't make a lot of sense to pay for relocation. Didn't realize you get a tax break for moving yourself. At least that's something. Where did you hear that? I'm dying to know more and my google search didn't turn up anything. I tried (but not exactly an exhaustive search)in English and Italian. Thanks! Love your blog, I lurk regularly! I heard this from the head of HR at an international company near Zurich. I'm currently looking into the various US visas, in case I do find a job in the US, and I was wondering if my bf (we'd probably get married) would be allowed to worked. You're right, he probably wouldn't be able to work unless he got his own employer sponsored visa. Not so different after all. I guess every country wants to protect its own citizens. It makes sense to a point.